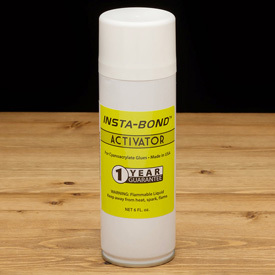 Insta-Bond Premium Aerosol Activator 6 oz. This fast-acting accelerator cures CA glue in seconds. The aerosol spray provides even coverage and helps minimize bubbling when used to mist the surface. Durable metal can won’t leak or allow activator to evaporate. Comments On Aug 22, 2017:This stuff works better than any other accelerator I have used. As the other reviewer said, it cost a little bit more but is worth it in the long run because you use less. The spray is a very fine mist which gives complete coverage with the slightest spritz. Since CA glue is cured not by the liquid form, but fumes from the accelerator evaporating, the finer mist particles have more surface area and therefore evaporate quicker thereby setting off the CA faster than a pump accelerator ever could. It lasted me a long time too. Comments On Jul 27, 2016:The name is self explanatory. Apply your glue and then spray it with the activator and instantly your item is bonded and sealed. If you can't wait for your super glue to dry, then this is the product you've been dreaming of. Easy to use, and it doesn't take much. Comments On Feb 11, 2016:I used to buy the pump spray bottle of activator, since it had 2 more ounces in the bottle & it cost less. However, I decided one day to try this aerosol can and see what it was like (after having had some large drops from the pump spray bottle get on some of my projects and damage part of the finish) so I gave it a try. I have to say, that I was very pleased with it, and have been able to get a more even (fine mist) with this aerosol can. I have also been able to do more projects with one can of it, than I was able to with the pump bottle with the extra 2 more ounces. So I would recommend this aerosol type to everyone. It may cost a little more, but in the long run, you don't use as much, get a finer more even spray, and you can do more projects with it, as well as it last longer because you don't loose any to evaporation like you do with the un-pressurized pump bottle over time.